Altivar 600 improves the pumping driveline. Most VSDs combine with other electromechanical or mechanical devices to form a driveline. However, in pumping systems, inefficiencies can reduce performance of the driveline. Connected to a pump, a Process Drive like the Altivar 600 controls speed, pressure, and flow in a dynamic process environment. The drive cuts its own downtime and function as a smart sensors for the entire driveline. It does this by monitoring motor torque, temperature, main voltage, and load energy consumption. 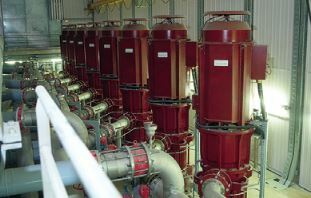 For industrial pumping systems, energy cost represents 40% of the TCO of a typical pump. It is possible to reduce the electrical consumption by at least 30%. Achieving this is through energy management practices and reducing the maintenance cost. Pumping system control plays a major role in improving energy efficiency. The Altivar Process VSD contains embedded pump management and process knowledge within it. These deliver accurate diagnostics and remote services capabilities. The embedded Ethernet web server system also enables customised process monitoring. Access to energy usage and process information is available anywhere at any time. It makes processes safer and improves returns in long-term operations. Altivar Process is a service orientated drive to reduce operational expenses across the entire water cycle. Simplified start-up and integration of the drives (smart process object) make it easier to implement. Intuitive built-in functions and diagnostics enable monitoring of pumping systems at the best efficiency point (BEP).